President Trump is welcoming a fight with the self-proclaimed "Worldwide Leader in Sports," ESPN. The president said on Twitter on Friday morning that ESPN "is paying a really big price for its politics (and bad programming). People are dumping it in RECORD numbers. Apologize for untruth." 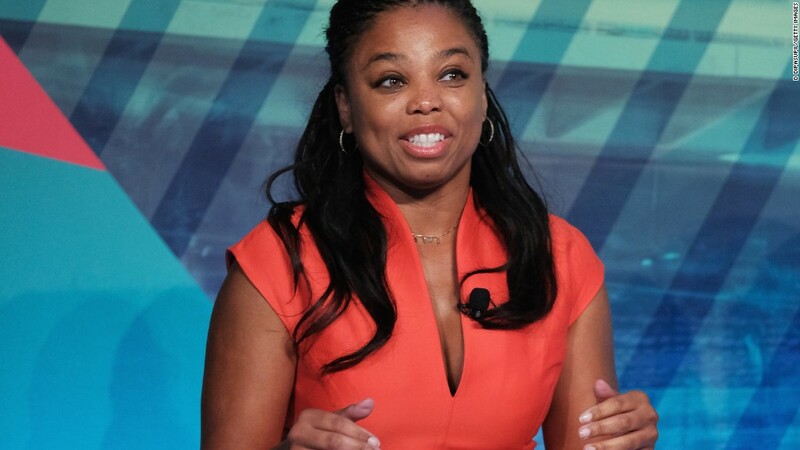 He was apparently referring to ESPN anchor Jemele Hill, who tweeted on Monday that "Donald Trump is a white supremacist who has largely surrounded himself w/ other white supremacists." Hill's assertion caused an uproar, particularly in conservative media circles, where ESPN's political bent has been a point of contention for years. Wall Street analysts and ESPN executives generally agree that ESPN's subscriber losses are primarily a result of cost-conscious consumers and a changing business model. But the president, through his tweet on Friday, sided with the conservative commentators who say it's really liberal bias that is poisoning ESPN and dragging down the business. White House press secretary Sarah Sanders, responding to questions about the controversy, has criticized Hill three days in a row. First, on Wednesday, she said the "white supremacist" tweet was a "fireable offense." The next day, on Fox News, Sanders said it was "highly inappropriate, and I think ESPN should take actions. But I'll leave that up to them to decide, and I'll stay focused on my day job." On Friday, Sanders had lots more to say. She called ESPN "hypocritical" and alleged that the network "ESPN suspended a longtime anchor, Linda Cohn, not too long ago for expressing a political viewpoint." ESPN disputes that. According to the network's version of events, Cohn was briefly sidelined -- not formally suspended -- for criticizing ESPN management decisions, not for expressing a political opinion. Back to the briefing. Sanders has come under scrutiny for suggesting a media company should sack a Trump critic, but on Friday she said she stood by her original comment. Neither Hill nor ESPN directly responded to the White House's new comments on Friday. But ESPN president John Skipper sent an internal memo Friday afternoon that said "ESPN is about sports" and is "not a political organization." Yes, he said, the network upholds certain values about tolerance and diversity. Yes, ESPN's employees are also citizens who have opinions about politics. But ESPN has social media policies for good reasons, he said, because personal comments "will reflect on ESPN." "In light of recent events," he wrote, "we need to remind ourselves that we are a journalistic organization and that we should not do anything that undermines that position." Skipper did not mention the president's criticism, but his message was clear: Let's cover the news -- sports and "the issues that intersect with sports" -- and stop being the news. For Trump, meanwhile, this week's controversy is a new front in his war of words with media personalities and institutions. Republican communications strategist Doug Heye, a CNN commentator, said it is "absolutely a fight the White House wants and, if you want to make a cynical ploy to hold your base after angering it, needs." Some Trump supporters have been critical of the president's talks about a possible deal with Democrats about the Deferred Action for Childhood Arrivals program. "Cutting a deal that amounts to what Trump and outside groups had repeatedly labeled amnesty caused many prominent supporters to question if they had been duped all along," Heye said. "So what is Trump going to do? Distract by tweeting at an ESPN host most people have never heard of, the travel ban and the attack in London." Hill, an African American woman, co-hosts "SC6" on weeknights. She has been an outspoken critic of Trump all year long. The current controversy erupted on Monday night she called him a "bigot," a "threat" and a "white supremacist" during a back-and-forth on Twitter. The next day, as people who were outraged by the tweets demanded action from ESPN, the network said that Hill's tweets "do not represent the position of ESPN." "We have addressed this with Jemele and she recognizes her actions were inappropriate," the network said. When Sanders was first asked about it on Wednesday, she said Hill's criticism of the president should be considered a "fireable offense by ESPN." Later that day, Hill issued her apologetic statement and ESPN said it accepted her apology -- clearly trying to move on from the matter. But the controversy has continued to fester. ESPN has been accused of having a "double standard," and so has Trump. After all, the now-president repeatedly called some of his opponents "racist" while hosting a show on NBC several years ago. As for the president's claims about ESPN "paying a really big price for its politics (and bad programming)," ESPN is the dominant sports network on television and a target for a wide variety of critics. Trump also said "people are dumping it in RECORD numbers." On Fox News and conservative talk radio, it's a popular talking point that the subscriber losses are due to rampant liberal bias. But there's little evidence to support that theory.